Oven Roasted Cabbage: easy, simple, inexpensive, comfortable and classic. Juicy, sweet and sour. A staple at every Ukrainian home. The ingredients needed are most likely already in your fridge. This dish is usually served straight from the oven, or it can be easily reheated on a low-heated skillet. Leftovers can be refrigerated for few days. It won’t lose that delicious taste. Serve as a side to a bigger meal, with piece of bread or mashed potatoes. 1. Preheat the oven to a 350°F. Prepare a 3 or 5 qt oven-safe baking dish and set aside. Preheat skillet to a medium and add 1/4 cup grapeseed oil. Meanwhile, wash, paper towel pat dry and cube 1 lb pork meat into about 1/2″ pieces. Transfer meat to a heated skillet and cook until it turns white. 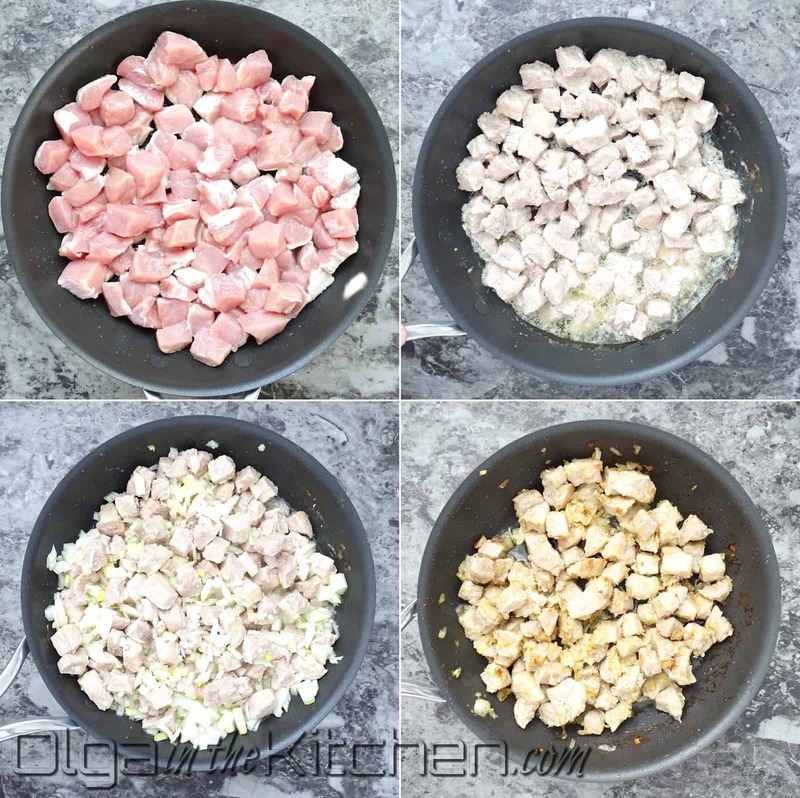 Then, add 2 small diced yellow onions and saute, mixing occasionally, until meat is just browned and onions are transparent and slightly golden. Remove from heat when ready. 2. 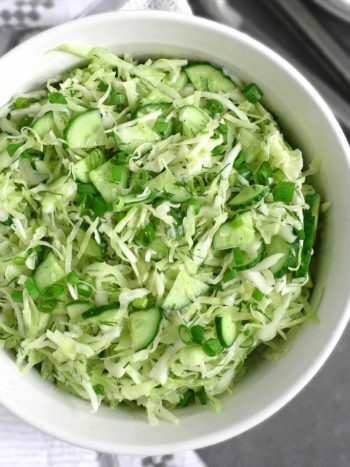 Place a mandolin over a large bowl, and shred the cabbage into thin slices, letting shredded cabbage fall into the bowl. Peel, wash and paper towel pat dry 6 medium carrots. Place a julienne slicer over the bowl, and slice carrots into matchsticks. 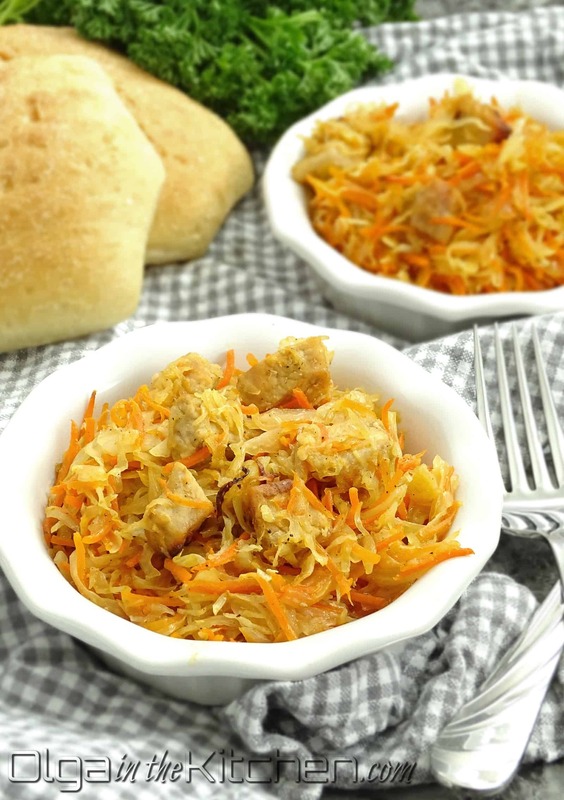 Mix cabbage and carrots. 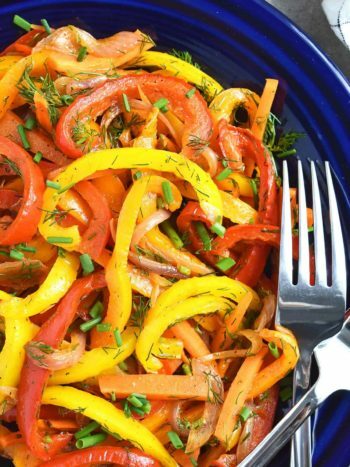 (For best results, use your hands OR kitchen tongs to fully mix and untangle both veggies). Add cooked meat/onion along with any remaining oil from the skillet to the veggies and stir with a wooden spoon. 3. In a small bowl combine and whisk: 4 tbsps ketchup, 4 tbsps grapeseed oil, 3 tbsps sugar, 2 tsps table salt and 1/2 tsp ground black pepper. Pour the mixture over the salad and combine everything. (For best results, wear a kitchen glove and mix with hand to blend in all the spices equally throughout the mixture. 4. Transfer salad mixture into a 3 or 5 qt oven-safe baking dish. Spread evenly throughout the dish. Cover with foil and put into the oven. Cook at 350°F for 30 minutes (until juices start bubbling at bottom of the dish). Lower oven to 320°F and cook for 1 hour. Keep foil on the whole time. Remove from the oven and check if cabbage is soft enough. Cook for addition 15-20 minutes if needed. 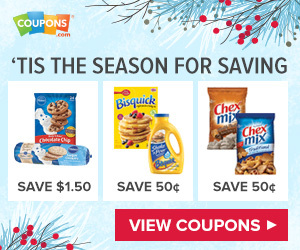 Enjoy hot ad fresh! **NOTE: Cooking time may vary. 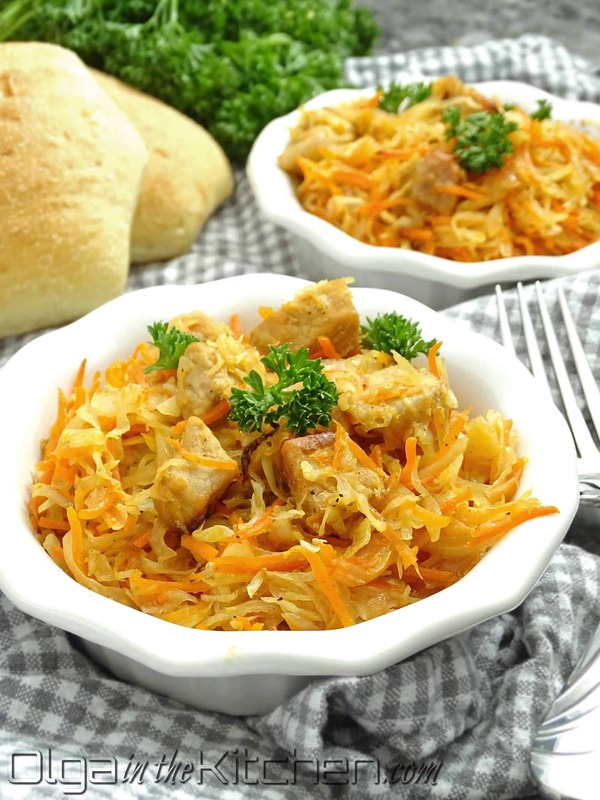 If your cabbage is sliced slightly thicker, it may take longer to soften. I would suggest using a glass baking dish for two reasons. 1. You can see when the juices start bubbling. 2. Food tends to cook faster in glass baking dish compared to stoneware. 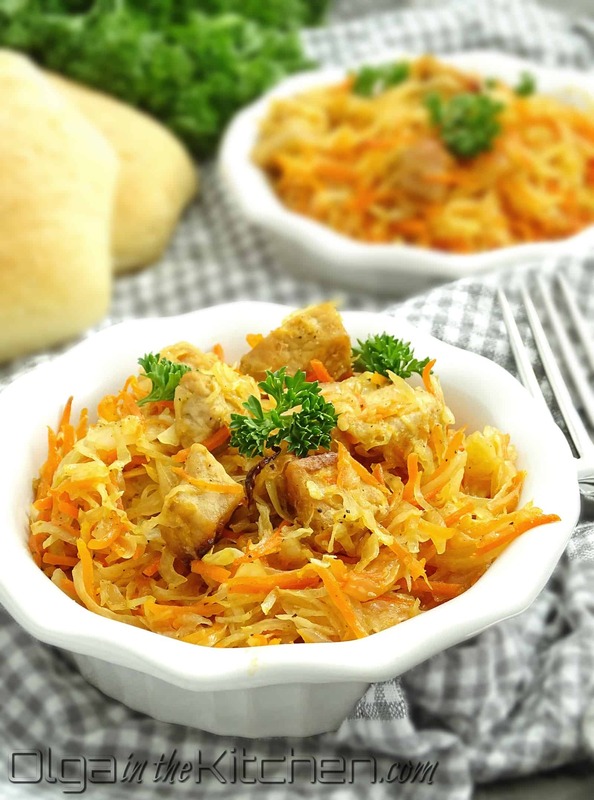 Ukrainian Oven Roasted Cabbage with pork: simple, comfortable, classic, yet juicy, sweet and sour. Preheat the oven to a 350°F. Prepare a 3 or 5 qt oven-safe baking dish and set aside. Preheat skillet to a medium and add 1/4 cup grapeseed oil. Meanwhile, wash, paper towel pat dry and cube 1 lb pork meat into about 1/2″ pieces. Transfer meat to a heated skillet and cook until it turns white. Then, add 2 small diced yellow onions and saute, mixing occasionally, until meat is just browned and onions are transparent and slightly golden. Remove from heat when ready. 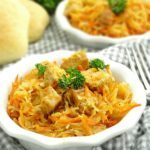 Place a mandolin over a large bowl, and shred the cabbage into thin slices, letting shredded cabbage fall into the bowl. Peel, wash and paper towel pat dry 6 medium carrots. 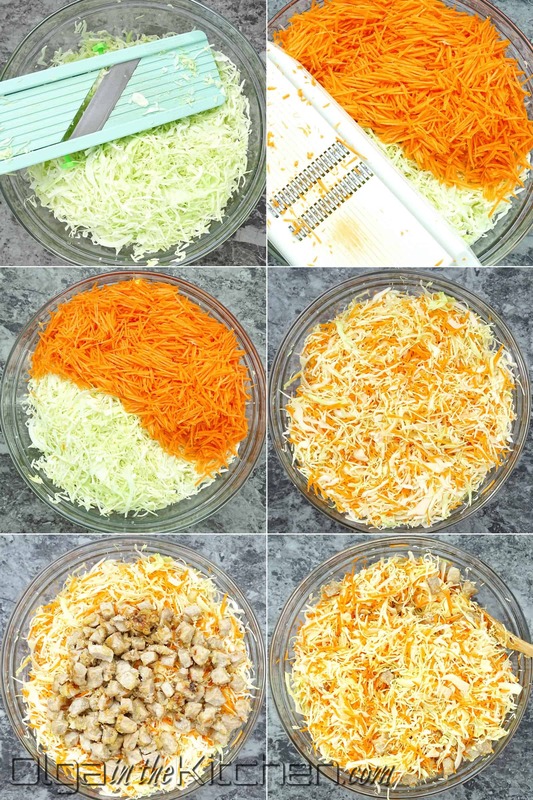 Place a julienne slicer over the bowl, and slice carrots into matchsticks. 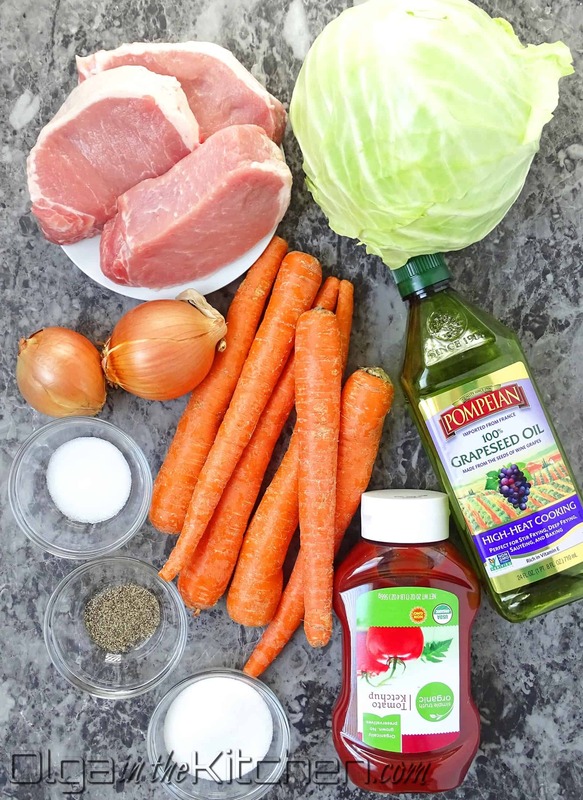 Mix cabbage and carrots. (For best results, use your hands OR kitchen tongs to fully mix and untangle both veggies). Add cooked meat/onion along with any remaining oil from the skillet to the veggies and stir with a wooden spoon. In a small bowl combine and whisk: 4 tbsps ketchup, 4 tbsps grapeseed oil, 3 tbsps sugar, 2 tsps table salt and 1/2 tsp ground black pepper. Pour the mixture over the salad and combine everything. (For best results, wear a kitchen glove and mix with hand to blend in all the spices equally throughout the mixture. 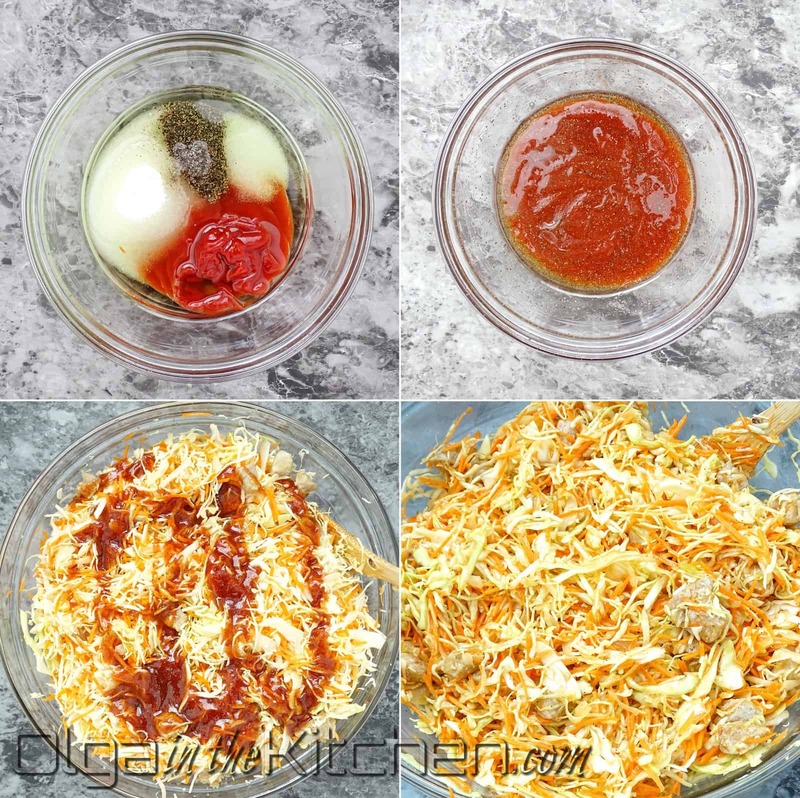 Transfer salad mixture into a 3 or 5 qt oven-safe baking dish. Spread evenly throughout the dish. Cover with foil and put into the oven. Cook at 350°F for 30 minutes (until juices start bubbling at bottom of the dish). Lower oven to 320°F and cook for 1 hour. Keep foil on the whole time. Remove from the oven and check if cabbage is soft enough. Cook for addition 15-20 minutes if needed. Enjoy hot ad fresh! 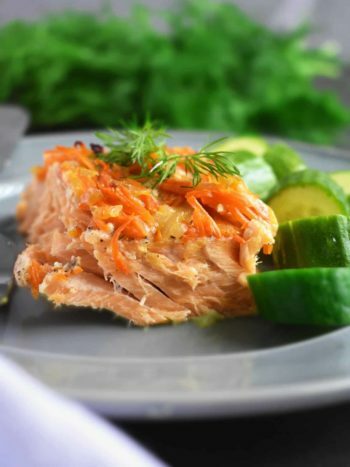 Olga thank you so much for such a great recipe! I just made it and it tastes sooooo good! I want to try your version of Homemade Farmer’s Cheese tomorrow, hopefully it will turn out the way i like. Thanks again and God bless! Ooops. Thanks for catching the error. It’s 3 tbsps. I will correct it 🙂 thanks Jessica? This is one incredible tasting dish! My kids are not huge fans of cabbage, but this way the dish was gone in an hour lol it was so delicious, I added to my book of favorite recipes! Love your work!